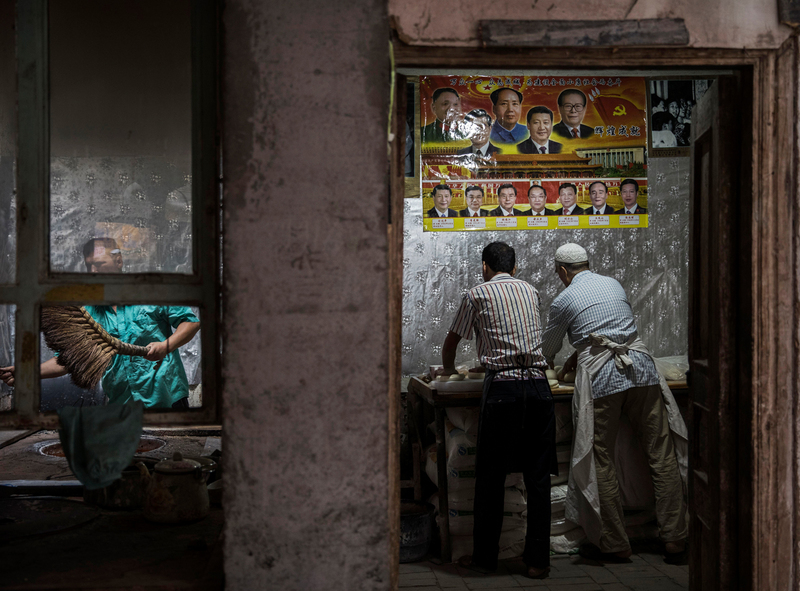 Ethnic Uighur bakers make bread under a poster depicting generations of the senior leadership of the Chinese Communist Party, in Kashgar, Xinjiang Uighur Autonomous Region, July 1, 2017. How long and to what extent have authorities in Xinjiang forced Uighurs into indoctrination camps? How long and to what extent have they compelled residents to give DNA samples to the state? What role has Chen Quanguo 陈全国 had in building Xinjiang’s new digital police state, and will he succeed in subjugating separatist thought? Are China’s Uighurs involved in global jihadi terrorism? Where and how do they get recruited, and how does China try to influence Uighurs overseas? They are part of a larger AP series titled “China’s Uighurs on Edge,” comprising 12 stories that seek “to flesh out the profile of a people whose voices have largely been silenced or gone unheard under the blanket of security in the region.” They also were published around the same time that the Wall Street Journal and BuzzFeed published similarly alarming stories about the police state in Xinjiang.